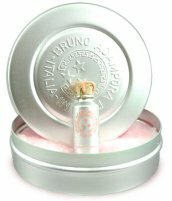 Bruno Acampora is the proprietor of an Italian line of perfume oils about which I know basically nothing. His website "invites you to join him on a voyage of the senses that spanned forty years", and according to Luckyscent, where the fragrances debuted earlier this year, the small aluminum bottles sealed with cork that house the perfumes are "unchanged in 30 years", so apparently the house is not new, but it is certainly new to me. Today's subject, Jasmin, was reportedly launched in 1978, and the notes include jasmine, cyclamen, cloves and ylang ylang. Jasmin starts out rich and strong, and more than a little indolic. At first I worried that it might be more jasmine than I can stand — it very nearly outdoes Serge Lutens A La Nuit in the buried-alive-in-flower-petals category. Just as I was beginning to question the wisdom of testing it in July, of all times, it started to settle. A bit of stemmy green arrives to temper the floral notes, and then the ylang both sweetens and mellows the jasmine without overpowering it. It isn't an overly complex fragrance, so that is pretty much the whole story. There is a little murmur of spice but I'd never have identified clove, and I'd guess there are other white florals in the blend as well, but it smells mostly of jasmine and ylang with the slightest hint of green. It is rich, but also very bright and clear (it is much brighter than A La Nuit). The lasting power is very good (although the ylang does eventually outlast the jasmine) and a little drop goes a very long way. Bruno Acampora describes Jasmin as a "hot August evening, a childhood memory, pure golden honey", and Luckyscent says "We can't imagine a better first date scent". Jasmin might be a perfect remembrance of a hot August evening, but it is the last thing I'd choose to wear on one, and I can't say I recommend splashing it on for a first date either. I think it is gorgeous, a real jasmine-lover's jasmine, but one person's gorgeous jasmine is another poor soul's worst indolic nightmare, and I've seen more than one comment of "skanky". If skanky jasmine is right up your alley, do try it. Bruno Acampora Jasmin is $175 (ouch!) for 10 ml of perfume oil at luckyscent. It can also be found at first-in-fragrance in Germany. Thanks for the review, R. Doesn't sound too much like my kind of thing; jasmine and I don't seem to suit each other. I invested in a sample of the BA Musc, and while it was nice, it subsided into pretty simple patch and ginger on me – couldn't see what all the fuss was about. But isn't it annoying when you saple one thing from a line, and dismiss the whole line, only to discover ages later that there was another item in the range that you really adore? Did this with Parfum d'Empire. I meant 'sample', of course. Sapling is quite a different activity. N, I didn't like the Musc either, or Blu, and for that matter, I really don't like perfume oils as a format. But now I'm very interested to try more from the line. Sballo looks very interesting! Where has everyone got to? LOL, has there been a mass evacuation over there, or something? M, Blu didn't suit me at all, but hoping to try more, and hearing good things about Sballo. I don't love that packaging either. And yes, jasmin with cloves seems a very nice combo. To my sample list it goes! Thanks! I don't like the idea of a cork either, especially if you're not going to use the fragrance up quickly. And this is so strong that 10 ml would last a VERY long time. I have tried Bruno Acampora’s Musc and I have to say I did not like it at all. Don’t judge this one by Musc. Unlike Musc, this one is femine. Absolutly love it!